This Veteran's Day, I'm remembering two relatives who each served in one of the two world wars. 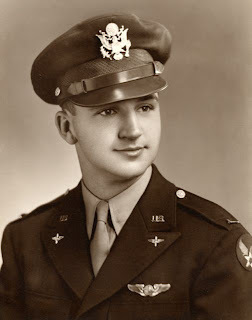 My dad's younger brother, Frank Ebner Gartz, was a navigator in the last year of World War II. He trained stateside from January, 1943, through December, 1944. 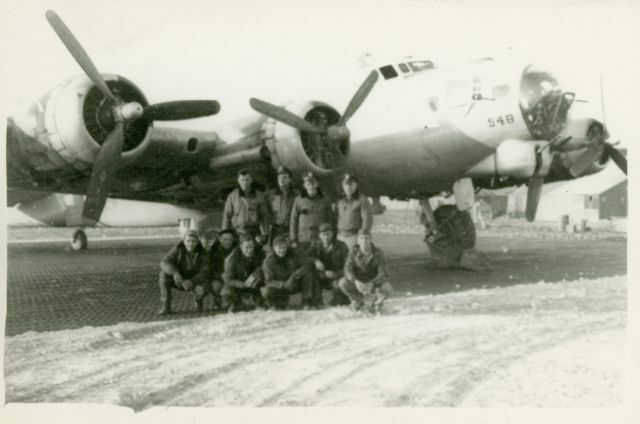 On Christmas day, 1944, he and crew of young men flew to Italy via North Africa to fly missions as members of the Second Bomb Group stationed at Amendola Air Base, near Foggia, Italy, on the Adriatic Coast. Frank Gartz and his crew. Frank standing 2nd from left. Today I flew my 10th mission, and it was the hottest thing I have seen so far. 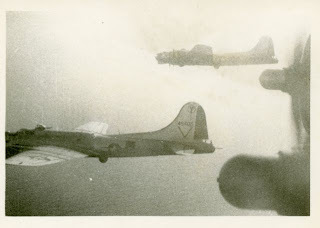 There was more and bigger flak. We bombed an oil refinery in North Eastern Vienna and those people don’t like us to drop our presents to them. to use photos from this blog). Lt. Booms, my bombardier, had a rough time. He said that they threw everything they had at us including their kitchen sinks. Booms has to sit up in that Plexiglas nose where he can see all that stuff exploding around him. It sort of gets on his nerves. I was trying to explain to him that when your time comes it doesn’t matter where you are…your number is up, and that’s all there is to it. 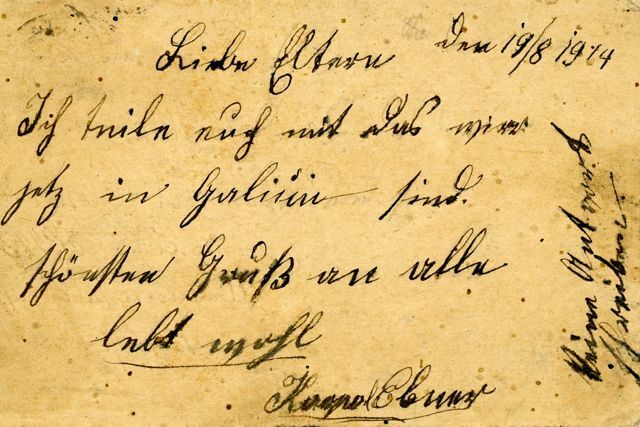 Such was the fatalism of a twenty-one year old who faced death every time he navigated his crew of other equally-young men on their missions. Veteran's Day was originally called Armistice Day, to mark the date, November 11, 1918, when the armistice was signed that brought an end to World War I hostilities. On June 1, 1954, the name was changed to Veteran's Day, to honor American veterans of all wars. 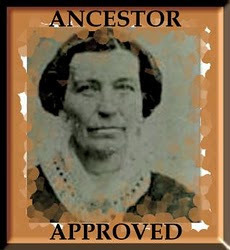 I'm also honoring the memory of my Great-Uncle. I share with you that we are now in Galicia. Most beautiful greetings to all. Farewell. 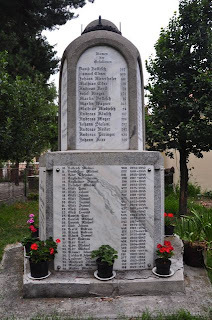 War Memorial to "The Fallen"
My grandfather, twenty-one when he came to America, missed fighting, and likely dying, in this awful war, as I wrote about in a previous post, An odd fellow. To read more about Sam Ebner (Jr.) and the memorial that stands in honor of him and his fellow soldiers from Grosspold, Romania, lost during that tragic war, see The Fallen-Part I, The Fallen-Part II, and The Fallen-Part III. Part III reprints the letter my grandmother kept, that reveals how she and my grandfather, 5000 miles distant from their homeland, helped make the memorial possible. So today, I thank all of our men and women serving so far from home for their service, bravery, and commitment in our own tragic war. I wish them safely returned into their families' arms again. To read my Chicago Tribune Perspective essay about my grandmother's heartfelt letter to my Uncle Ebner, written on November 11, 1943, into which she "poured all the mothering she could muster," go to this link: "Words, War, Worry"
Most of the content of his post was originally published in honor of Memorial Day, 2012.
blog, you must ask permission, credit the photographer, and provide a link back to this blog, Family Archaeologist. Seventy years ago today, my Mom and Dad vowed to stick together in good times and bad, in sickness and in health. 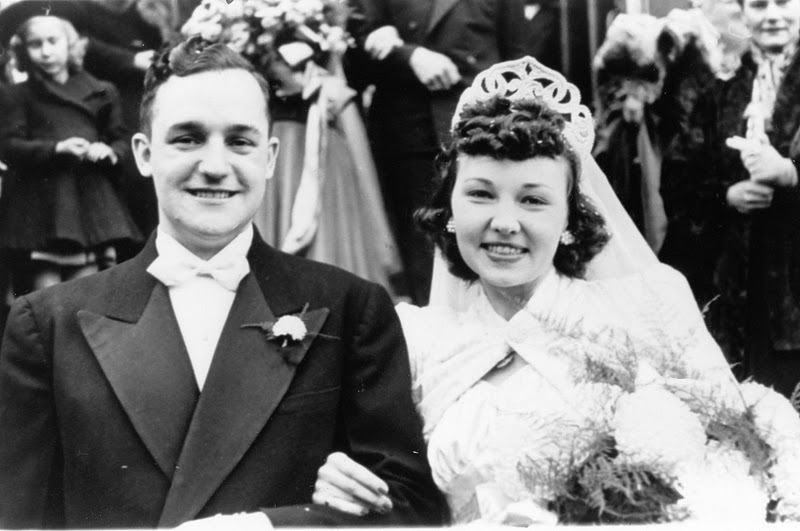 Those vows were tested across the decades, but despite life's pummelings, they stayed together to the end. 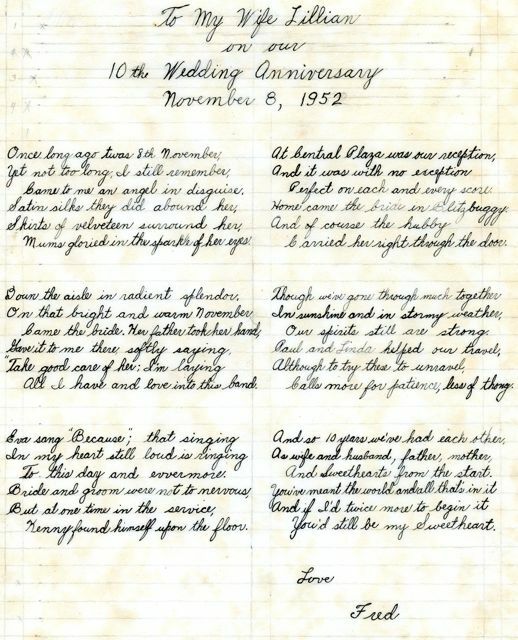 This post was originally published last year on their 69th anniversary. I publish it again because seven decades deserves a shout out. "The bride wore a gown of egg-shell satin with a fingertip veil held in place with a seed pearl tiara. Her flowers were white chrysanthemums." 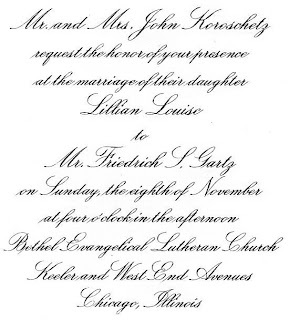 The matron of honor wore a "gown of fuschia velveteen and net with a Juliet cap and carried pom poms." The bridesmaids' gowns "were of plum velveteen and net." Mom saved small samples of the fabric, labelled as to who wore which. Mom planned the bridesmaid’s outfits to be practical. It was the war years, after all, and Mom wanted her bridesmaids to get use out of the outfits after the wedding. Remove the net over the skirts, and each had a beautiful velveteen suit. 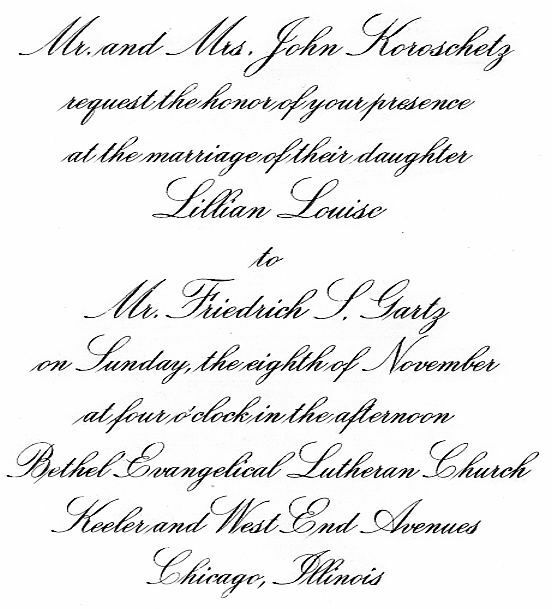 Of course, being a skilled executive secretary for the president of the Bayer Company, mom created a minute-by-minute run-down of the ceremony and reception, who had to be where at which time. 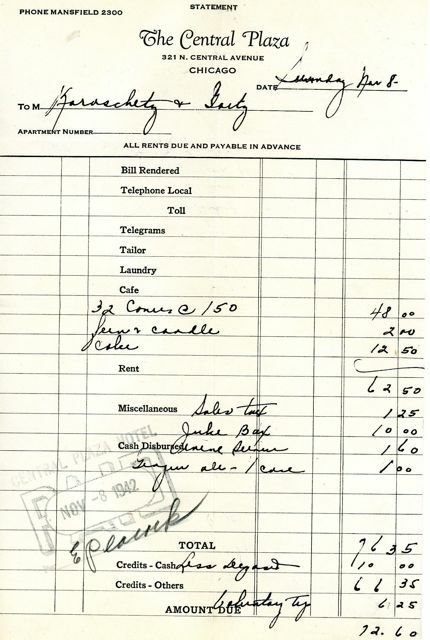 Speaking of the reception, what do you think that might have cost back in 1942? So glad you asked! 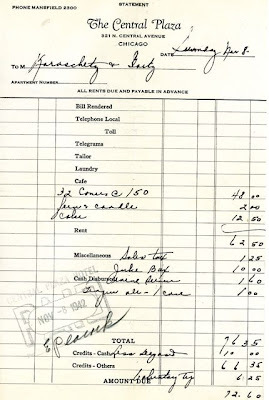 Here's the receipt for the Central Plaza Hotel. 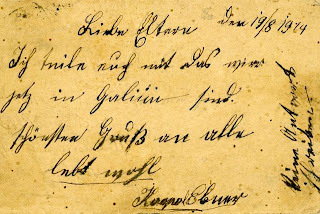 (Click link to see postcard image). This bill appears to include everything. I'm assuming the line item: "32 covers @ $1.50 each" refers to the cost per plate of dinner. If you have a different idea, weigh in. Cake for 32: $12.50. Juke box: $10.00. The rest, including candles, tax, tip, ferns, and a case of ginger ale comes to a grand total of $72.60. I know my parents weren't tee-totalers, so they must have supplied the liquor separately. 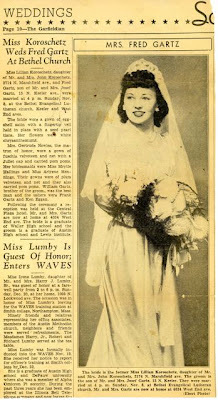 If you'd like to see how their courtship started and progressed, click on the post Falling in Love 70 Years Ago, and follow along with my mother's ecstatic diary entries week-to-week. Please click below this post on the red word, "comments." 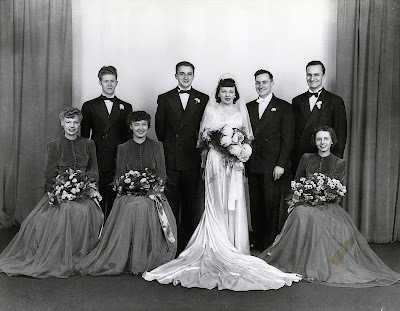 Any ideas what your parents' or grandparents' weddings cost? It would be fun to compare notes.